Rep. Alexandria Ocasio-Cortez and her chief of staff have been removed from the list of board members of the Justice Democrats PAC which orchestrated her political rise. Ocasio-Cortez and chief of staff Saikat Chakrabarti were officially removed from Justice Democrats’ board on March 15, according to a corporate document filed that day to the Department of Consumer and Regulatory Affairs in Washington, D.C.
Ocasio-Cortez never disclosed to the Federal Election Commission (FEC) that she and Chakrabarti controlled Justice Democrats while it simultaneously supported her primary campaign, the Daily Caller noted. Former FEC Commissioner Hans von Spakovsky wrote in a March 10 Fox News op-ed that he believes there’s sufficient evidence to “justify opening a criminal investigation” into Ocasio-Cortez. AOC and Chakrabarti joined the board of Justice Democrats in December 2017, according to the political action committee’s website. The website also said the Ocasio-Cortez and Chakrabarti held “legal control over the entity” at the same time the PAC was playing a key role in supporting AOC’s campaign prior to her primary victory over longtime incumbent Democratic Rep. Joe Crowley in June 2018. 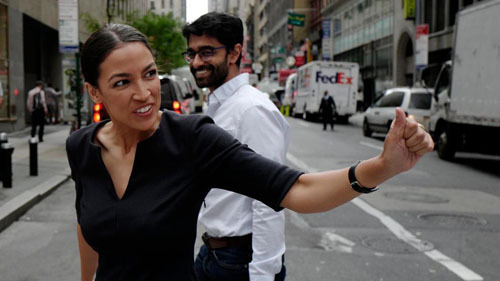 Replacing Ocasio-Cortez and Chakrabarti on the Justice Democrats board are Alexandra Rojas and Demond Drummer, both of whom have close ties to the congresswoman, the Daily Caller reported. The Green New Deal was written in a single weekend in December by New Consensus, Justice Democrats and Ocasio-Cortez staffers, along with climate advocacy organization the Sunrise Movement.